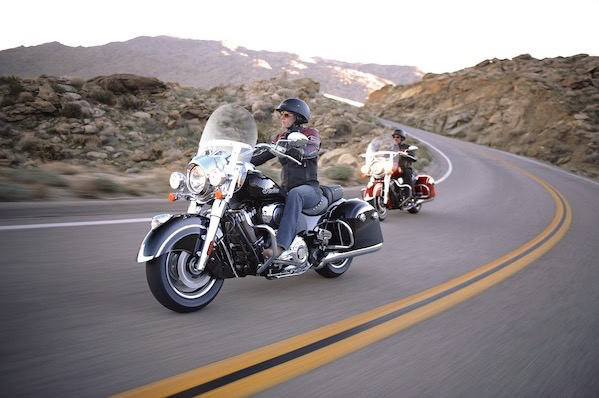 THE LAST few years have seen huge growth in the big-bore touring bike market, especially the American-style machines. Much of that is down to how good the new Rushmore Harley-Davidson machines are, and one of those is the Road King – and now we have the Indian Springfield – a take on that style of bike, with a big removable screen up front and hard cases up the back. Indian motorcycles were first built in Springfield, Massachusetts, USA in 1901, so the new machine first built 115 years later is named for the birthplace of the brand. 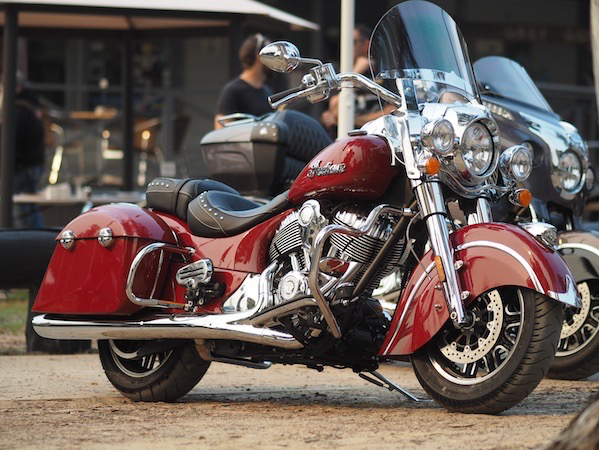 It joins a line-up dominated by large-capacity touring machines, but it’s the first Indian to have a screen and hard cases – until now you’ve hard the Roadmaster and Chieftain with hard cases but also large fairings or the Vintage with a screen and leather saddlebags. The plan was to build a beautiful machine built for two capable, standard, of giving a couple the perfect weekend. The Indian Springfield is more than that though, stripped of the panniers and screen it’s an incredibly good looking wildly retro cruiser and equipped with a few optional accessories including the top case from the Roadmaster and you have a machine able to take on the long distance tour in comfort and practical style. 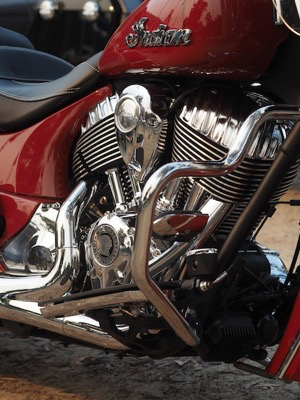 ‘111’ is brazenly displayed on the air filter of the Springfield, telling the world the machine is powered by the 111 cubic inch Thunderstroke motor. A 49-degree V-twin styled to look reminiscent of the Indian motors of the 1940s and ’50s, the Thunderstroke might look old, but it’s not. With gobs of torque from right down low in the rev range, the Indian Springfield is easy to get on the move, carries all the weight you’re ever likely to want to load up with ease and provides enough performance to easily get around slow moving traffic. The six-speed transmission is slick, although it has a fairly long throw on the lever, but it’s not as clunky and agricultural as the transmissions on many cruisers. Like any self-respecting cruiser engine it shakes in its mounts, but it’s a low-level, low revving shake, one which speaks to you of its power, not annoys you with its vibes. Top gear feels like a true overdrive, where the massive pistons inside the 1811cc engine are firing every second lamppost and the speed limit feels like the engine is hardly above idle. Maximum torque of 161.6Nm is reached at just 3000rpm. Because it’s so relaxed at speed, you do need to be prepared to change down to overtake, but that’s a small price to pay for the torque available when snicked down into fifth or fourth – the Indian Springfield then takes off around caravans and trucks at a pace you wouldn’t expect from a 388kg motorcycle. Feeding the beast is fuel injection, and in standard trim it’s a bit throttled but the standard air filter and exhaust – freer breathing units are available as options and improve most aspect of the Springfield’s engine. Throwing a few dollars at your Indian dealer for a stage 1 kit will make your bike look that little bit more special and go a lot better, although until I rode an upgraded example I wouldn’t have said it needed more horsepower. Torque is a twisting force, and preventing the Thunderstroke motor from tying itself in knots is a stiff aluminium frame from the other touring bikes in the range, fat 46mm conventional forks and a single air-adjustable shock at the back. 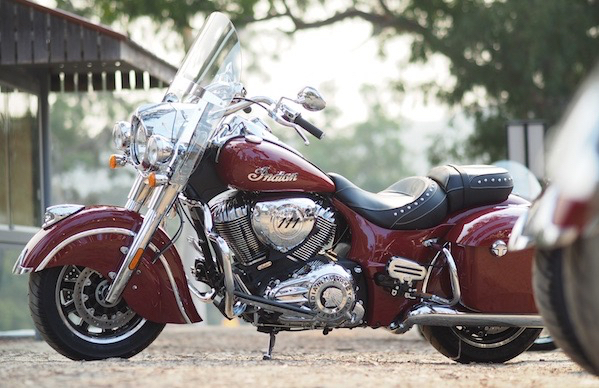 Interestingly, Indian has chosen to use chassis geometry quite different from the other machines in its range, which has resulted in a quicker-steering, more dynamic machine than the other bike Indian tourers. 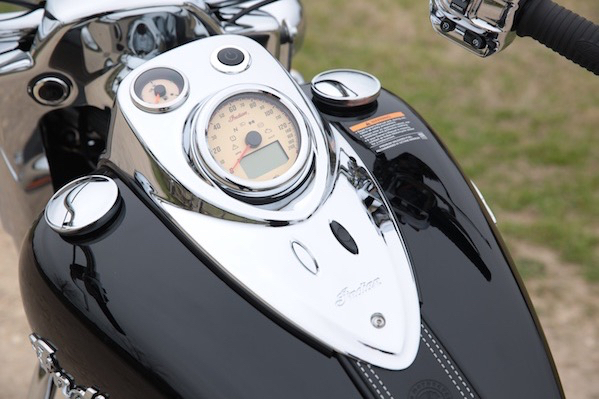 The steering head angle is the the same as the Roadmaster and Chieftain tourers, but with a lot less trail, which means it turns much quicker, making it a lot more fun in the tight stuff, although at the price of less stability – but not so much that you’d ever call the Springfield nervous. For a big American tourer the Springfield is a lot of fun in the corners, although the wide, pulled-back handlebars made the front wheel feel like it was a long way forward and didn’t give the feedback I’d come to expect from my earlier tests of the Chieftain and Roadmaster. 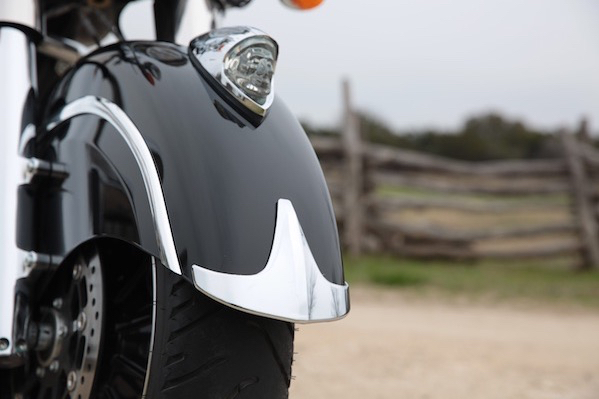 The suspension provides a very comfortable ride, Springfield gliding across bumps and potholes without fuss or sending the shocks into the rider. Indian’s stylists really love the retro style. From the lit front ‘Fender’ ornament to the massive guards themselves, to the engine which looks like it’s a side-valve design to the luxurious king-queen leather saddles, most of the Indian range – the exception being the Scout – looks like it could have been built 50 years ago. It’s cruel fun telling passerbys how it took years to find all the parts needed to restore the machine to what you see here, but it’s just so easy to do. Stripping the Springfield back to basics is easy. The panniers are held on with a couple of internal fasteners and the screen pops off in seconds, without tools. The optional top box similarly can be removed quickly without tools. “What about security” I hear the paranoid one from the cheap seats screaming… well, the panniers can be locked with a key or electronically, which means you can’t get to the latches, and there’s provision to install some torx screws into the frame of the top box, preventing its removal – and you can’t get to the screws without removing the panniers. In naked form the guards look gigantic, but at least the black leather seat with white stitching stands out. It’s an extra-comfortable work of art your arse will thank you for buying. Other American styling touches include the tank-mounted single dial instruments (fully electronic, of course), gorgeous headlight nacelle and twin-filler cap fuel tank (the one on the left is a fake). Fuel’s cheap, so they didn’t bother putting a locking cap on the Springfield. Feel free to correct me if I’m wrong, but I reckon the first big American touring bike with an aluminium frame might have been the Gold Wing… and it’s certainly still not common. But along with the aluminium chassis Indian has filled the Springfield with modern, high-tech gizmos and whatsits. First, there’s the things you’d expect – ABS and fuel injection. But did you expect ride-by-wire and electronic pannier locking? I was pleased to see the cruise control carry over from the other touring models, as has the keyless fob starting. So Indian, why no electronic steering lock? Ducati’s done that one. Thanks to the new cast wheels on the Springfield we do get tyre pressure monitoring, and the instruments will also tell you the air temperature, range, tacho, fuel economy and a whole heap more either on the LCD readout or via nine – count ‘em, nine – idiot lights. Thankfully they are hidden until needed. The Springfield is designed to be a great place to be. I mean, it’s almost big enough to have its own postcode, so there’s no shortage of room, although I was wishing the screen was either a bit taller, or a bit shorter. Taller and there’d been still air behind it, shorter and my helmet would be happily in the breeze, but the stock one just caught the top of my Shark and rattled it. So if Indian gave me a Springfield I’d request it with the two-inch lower screen and the two inch taller screen. Then I’d be happy with the weather protection, although I’d add the optional heated hand grips for winter tours. I’d also switch the handlebars out for units which I’d have to reach forward for a bit more, because I found the riding position just a little too upright, but this is the beauty of these types of bikes – there’s a plethora of options, so you can tailor the Springfield to suit yourself. Although why anyone puts ape-hangers on defeats me. The standard panniers swallow a decent load of luggage, and they are really convenient on the road. Being top-loaders you can access them whenever stopped and the electronic locking is pretty cool, too. What did surprise me about the Springfield was its ability in the corners, generous cornering clearance, grunt out of the bends… it added up to a fun factor surprising in anything with footboards. Now, while I’m thinking of it, the Springfield is also fitted with passenger footboards, which are adjustable in position, so they can be set up to give your pillion the most comfortable ride they can, and for those of us who wake up next to our pillions, that’s very important. Unfortunately, all this fun comes at a cost, that being $33,995 (in Australia), which is close enough to the Harley-Davidson Road King’s sticker it’s not really worth worrying about the difference. So what’s it going to be, the established King or the one who would steal the crown? 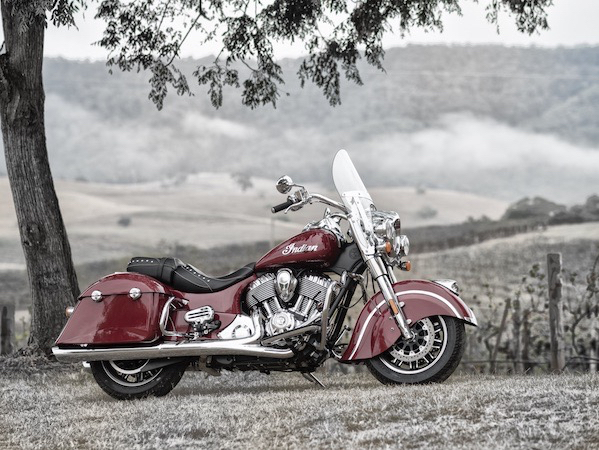 The Road King is a popular bike, for good reason, but the Indian Springfield represents something a bit different, a little more unique but just a soulful. Get a test ride on both before you make the decision.